Elder senior pitcher Kyle Klingenbeck (left) and his brother, junior catcher Kory Klingenbeck. CINCINNATI — When Kory Klingenbeck wakes up each weekday morning at 6:30, he can’t wait to talk baseball with his brother, Kyle. 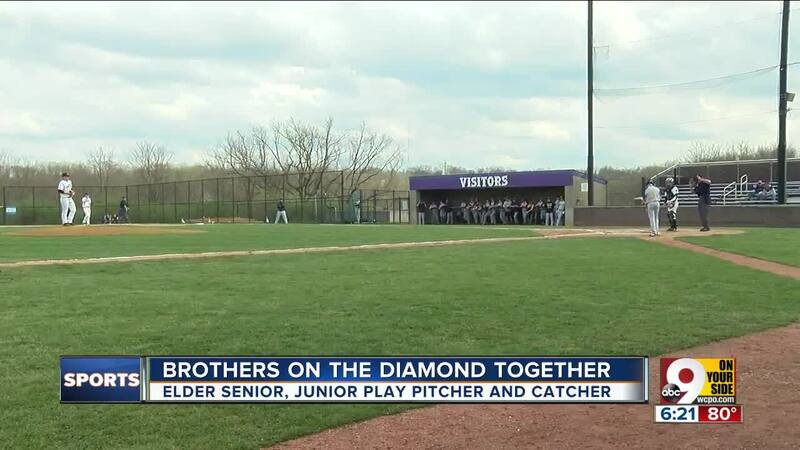 The Elder High School baseball teammates have a morning routine in preparing for the drive from their Delhi Township home to Price Hill. Kory, 16, a junior catcher, usually eats cereal. Kyle, 18, a senior pitcher, prefers oatmeal or breakfast sandwiches. That's a small portion of a very large Sam's Club grocery bill every two weeks. As Kyle drives his brother over to school, the conversation generally involves baseball. They discuss the upcoming game that night or even specific strategies, whether at the plate or defensively. The brothers will give each other a difficult time on occasion at home as siblings tend to do. Kyle, a nose guard on Elder’s football team, likes to say to he can pin Kory in a playful wrestling match — or that he can grow facial hair better than Kory. It’s baseball that is their common language. The Klingenbeck brothers are a significant reason why Elder (6-2) has won six of its first eight games. Kevin Klingenbeck and his wife, Leslie, couldn’t be more proud of their sons. Kevin, a 1987 Elder graduate, was an infielder who later played at Wright State. His younger brother, Scott Klingenbeck, played at Elder, Oak Hills and Ohio State before a four-year pitching career in the majors. Kevin said he knows the nerves his family went through when he and Scott played high school baseball. Kevin doesn’t like to sit in one place during Elder games while watching Kyle and Kory. Leslie enjoys watching her sons play catch in the backyard. Their baseball journey has been a lifelong one that binds the family together. Kyle, a Northern Kentucky University signee, is 1-1 with 11 strikeouts on the mound this season. Unfortunately, he had to leave Monday’s game against visiting Moeller in the third inning due to an injury. Before the game, however, the brothers reflected on their journey together within the program. The pair started as a battery (pitcher and catcher combination) in 2017 when Kyle was a sophomore and Kory a freshman in a game in Johnson City, Tennessee. Kyle was nervous when he took the mound, knowing his brother was behind the plate, but he threw a fastball right down the middle to open the game. Kory said he will cherish all his memories with the Elder baseball program, especially when Kyle goes to NKU next year.